I’ve always wanted to make panzanella, the Italian-style bread salad that uses day-old or stale bread. But watching Gourmet’s Diary of a Foodie and its episode in Tuscany again finally pushed me over the edge. This is a really easy light lunch or dinner, perfect for the summer, when tomatoes are at their very best, and there isn’t any need for a recipe since the ingredients are pretty much whatever’s currently in your fridge. Cut 6 leaves of romaine lettuce and 1 juicy beefsteak tomato into bite size pieces. If you have onions available, you can caramelize those and include them too. Take day-old Italian bread (or any other hearty bread like sourdough) and tear into chunks. Since the bread is most likely going to be very dry, add just a little water to soften it up again. 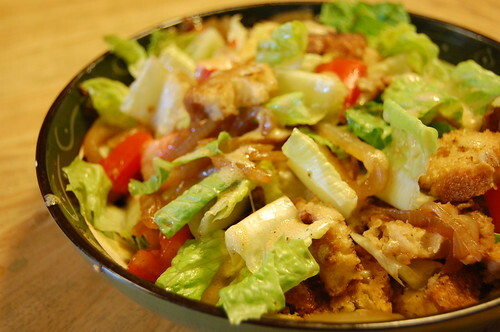 Put lettuce, tomato, onions and bread in a large bowl. Add whatever dressing or vinaigrette you prefer; I added my own Dijon dressing (Dijon mustard, red wine vinegar, E.V.O.O., salt and pepper) but balsamic would work great here as well. If you have fresh herbs like basil on hand, that adds an extra dimension to the dish. Mix everything with your hands so the flavors marry and the juices from the tomato and dressing soak into the bread. Let sit for about 15 minutes before eating. So simple, so filling. And relatively healthy too, at least compared to all the barbecue food I ate this past weekend. Seeing how I’ll soon be leaving for school again in little over a month, it’s time that I started cooking regularly again to develop a good habit. You are currently reading A Summertime Salad at Notes on Food.